Have you heard about The Cruise Show? It is an exhibition devoted to cruise holidays. If you are slightly curious about cruising, you should plan a visit to the show. Even if you have more voyages under your belt than the captain has, the show is an excellent resource at your disposal. Here are my reasons why visiting this long-running exhibition is worthwhile. New for 2017, the organisers of Europe's largest cruise show are waiving the entrance fee. The tickets for The Cruise Show, in partnership with the Daily Mail, The Mail on Sunday, and MailOnline, were originally £10 a head (or £6 if pre-booked online). So why make them free, I asked the organisers? The answer is simply to expand the reach of the show to a wider audience of cruise holidaymakers. Even though the tickets are free, I would still advise you pre-book them. Tickets might be available at the door, but if you are travelling from outside the city to attend, you will want the peace of mind knowing you have secured your pair. The dates for your diary are Saturday 16th September 2017 and Sunday 17th September 2017 for the NEC Birmingham show. The London Olympia show is on Saturday 17th February 2018 and Sunday 18th February 2018. Birmingham's NEC arena is next to Birmingham International train station, making it a breeze to reach. Direct train services are available from Holyhead, London Euston, Manchester Piccadilly, Glasgow Central, Northampton, Edinburgh, Aberystwyth and Pwllheli, and Bournemouth to name a few. If, like me, your train cuts through Birmingham New Street instead, just switch onto the short ten-minute direct train to Birmingham International. Heading to Birmingham by car? Junction 6 of the M42 is where you will need to head. The National Exhibition Centre in Birmingham sits next door to the city's airport, and both have signposted directions on the surrounding roads. The cost of parking, payable directly to NEC, is £12 per car or £20 for priority Express Parking close to the entrance. You can pre-book a space here. The Birmingham location is central. Travel from Manchester, Cardiff, Bristol, Swindon, Oxford, Reading, Cambridge, Nottingham, Sheffield, Leeds, and Liverpool and within just a couple of hours you can reach the exhibition centre. In fact, in a couple of hours, you could travel from central London to the NEC, depending on traffic of course. If you live in the South East, you might want to head to the show at Olympia London instead. The Victorian exhibition centre is next door to Kensington (Olympia) tube and railway stations. The tube stop sits on the District Line while Overground and Southern Railway services stop at the train station. If you are visiting from afar, you will most likely find yourself arriving at Waterloo, Paddington, King's Cross, St Pancras, Euston, Charing Cross, Victoria, London Bridge, Fenchurch Street, or Liverpool Street. Take the Underground to Kensington (Olympia) with ease, although you may need to change lines to join the District Line. If you fancy driving into central London (are you mad?! ), multi-storey parking is available. I strongly recommend pre-booking to ensure a space, which you can do up to four months before the event. Expect to pay in the region of £30 per car for a day. There is an app for just about everything these days, and there will soon be an app for The Cruise Show. The technical boffins are busy at work, cramming in exclusive offers, competitions, and useful content to help you find your next holiday. It will also have a floor plan and exhibitor list, and there are plans for it to act as your digital ticket to gain entry to the show. I expect that Apple iOS and Google Android apps will be released soon. Major players in the industry will be there. Those lines that do not have a stand at the show are likely to be involved with the theatre talks or entertainment. Representatives from each operator will be on hand to help guide you through what is available. Whether you are just browsing or are ready to book your next cruise, you will find the information you need on hand at each display. Besides the cruise lines, other businesses will exhibit at the show too. Cruise websites and magazines, hoteliers, and tour companies will be there to help you enhance your next holiday. Several tourist boards will also be on hand, showcasing their regions. The beauty of The Cruise Show is that representatives of a diverse range of companies descend on one place. Cruising is no longer exclusively for retirees, and there are options for all types of traveller. Whether you are looking for a singles holiday, a honeymoon, a family cruise, an LGBT ship, something on a tight budget, a top of the range luxury holiday, or something in between, you will find a holiday here. Small ship operators will explain why their tiny vessels can provide an off-the-beaten-path experience while the big boys will showcase why their ships are floating resorts, offering something for everyone. If you have never cruised before, consider a mini cruise to test the waters before committing to a longer voyage. While these mini breaks are not identical to the experience you find on longer trips, they are an excellent way to try cruising to see if you like this style of holiday. I've made a list of the best upcoming taster cruises here. Mediterranean and Caribbean cruise holidays are by far the most popular, but there is a world of choice out there waiting for you to discover. From polar cruising to exploring Asia by cruise ship, there is plenty of variety available. The time of year affects some trips. Destinations such as the Norwegian Fjords change radically by season, so a cruise in Summer and a cruise in Winter will be completely different. Seasonal events make a world of difference too - a Christmas cruise feels festive, even in the Caribbean sunshine. Head to The Cruise Show to discover destinations you may not have considered and itineraries that stray from the norm. You will also find first-time trips that are perfect for hitting top destinations in Europe or the Caribbean on one cruise. Experts including cruise line executives, industry experts, and journalists battle it out to explain their perspectives on a range of topics spanning the world of cruising. These seasoned travellers impart their insider knowledge and tips. Seats are available on a first-come-first-served basis, so make sure you plan around the times of these debates. Several stages host informal discussions on a variety of topics, including cruise lines, cruise styles, and destinations. Each talk will impart plenty of ideas for you to look at, so if the sheer choice baffles you, head here to seek clarity. 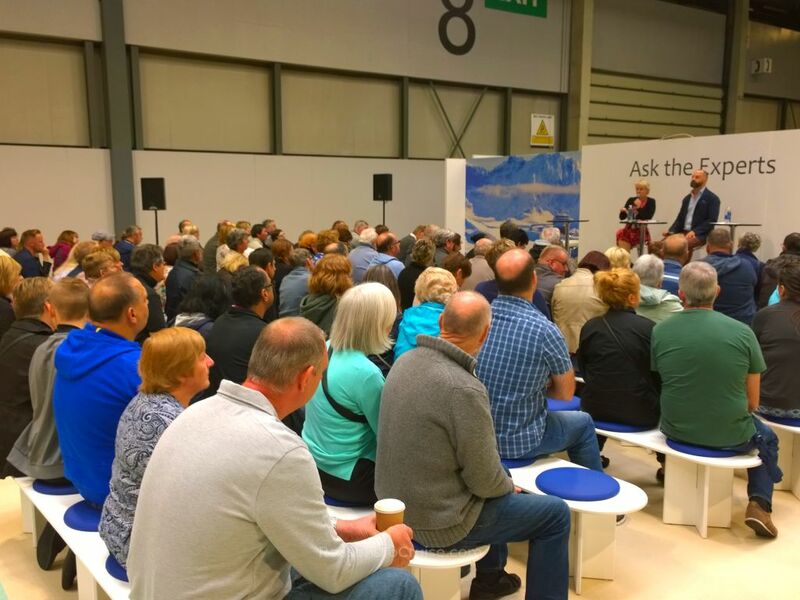 Historically, celebrity speakers, explorers, journalists, and tour operators have headlined theatre talks at The Cruise Show events in London and Birmingham. Again, seats are available on a first-come-first-served basis. Free tickets to the show are one thing, but exclusive show discounts are one of the best reasons to visit The Cruise Show. 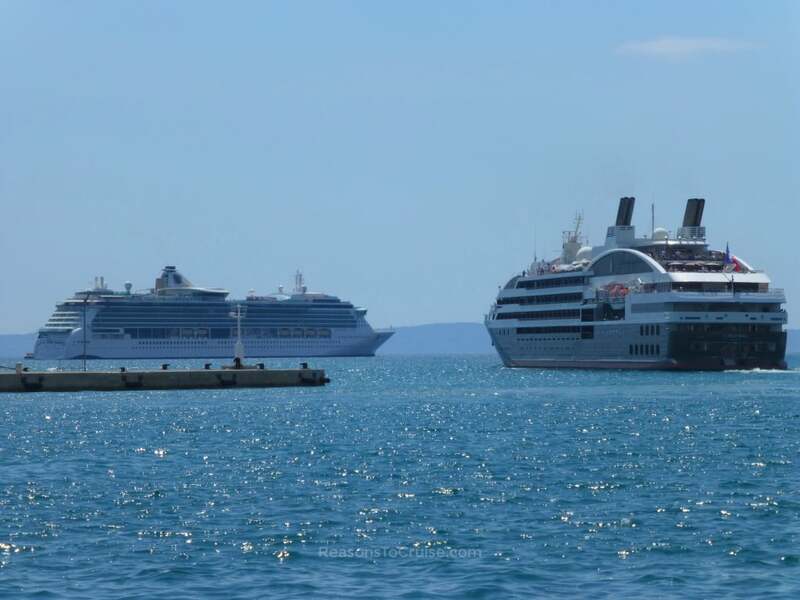 Expect to see discounts on cruise fares, free onboard credit (that you can spend on premium dining, in the bars, on shore excursions, on pampering at the spa, etc. ), cabin upgrades, or a combination of promotions. If you have a particular cruise holiday in mind, consider visiting the show to see if it is available at a discount or with extra perks. You might even find a similar cruise available from another cruise line that tempts you even more. Expect competitions too. Everyone loves winning stuff, so make sure you enter the show competitions to be in with a chance of scooping a top prize. Have a holiday photo you are really proud of? The Cruise Show is running a competition looking for the best destination photo. It could be of a port of call, an excursion, a view, food, or of the local culture. The winning photo will be professionally printed, framed, and displayed at the show. You get to keep the artwork afterwards. Details on how to enter are here (closes 7th July 2017). Can I book a cruise at the show? Yes. Cruise lines will be happy to help you find your ideal next break. Can I buy food and drink at the exhibition? Yes. Cruise holiday planning is thirsty work! Is disabled parking available? Yes, subject to availability. Is WiFi available? Yes, both NEC Birmingham and Olympia London provide free WiFi across their venues. Can I bring the kids? Yes. The organisers are planning "top secret" entertainment which I will spill the beans on soon. Make sure you come back to find out what they have up their sleeves. Do I have to book a cruise at the show? Absolutely not. You might lose access to show special offers if you book later on, but there is no obligation to buy right there right then. Remember, tickets are free. There is a chance that some will be available at the door, but to avoid disappointment, claim your free tickets online here. Are you planning to visit The Cruise Show this year? Let me know in the comments below what you are most looking forward to seeing at the event. Disclosure: This post was written in collaboration with The Cruise Show, but the content and opinions are my own.